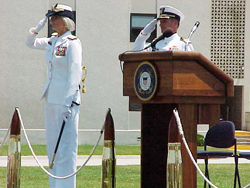 This is a story about Rear Admiral Sally Brice O’Hara, an impressive woman by any standard. She is a woman who knows something about leadership. She is a leader who knows something about compassion and service. 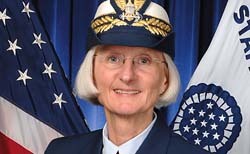 For 38 years she has served her country in 19 different assignments in the United States Coast Guard. Kitch and I met Sally Brice-O’Hara in 2001 at Training Center Cape May. We were there to produce a program for our series, Windsor Park Stories. It was one of the best days of our career. 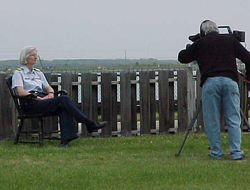 Sally was the Commanding Officer of Training Center Cape May. She was generous with her time, and every one of her associates helped us with our work. We did not know it when we arrived, but before the visit ended we received a crash course in leadership from a woman whose friendship we earned that day. Quiet and determined by nature, Sally took us on a walking tour of the training center. It is her style to demonstrate with acts of competence, kindness and thoughtfulness rather than embellish events and experiences with words. 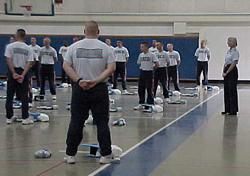 Watching her engage with the young men and women who would spend less than two months learning the code of conduct and the practices of the U.S. Coast Guard, three things were obvious. This was a woman who loved her job. This was a woman who enjoyed all the responsibilities that came with the job. This was a woman who did her job well. 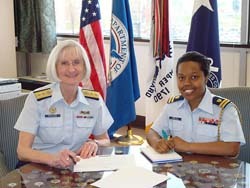 During her interview, the person who was about to become the second female Admiral in the history of the U.S. Coast Guard talked about the values that helped her earn that honor. She identified honesty, integrity and responsibility as the most important values she learned at home from her parents and as a child growing up with a love of horses and all things equestrian. When she entered the Coast Guard after college, she found these values to be aligned with the core values that are proudly displayed on bulkheads around the training center: Honor, Respect, Devotion to Duty. She was emphatic about one point. Character does count. It is the foundation that will last a lifetime, and it is essential to leading a good life. Over the years, Admiral Brice-O’Hara has taught these values as a leader, a mentor, a crisis manager and a friend. Accountability is a vital component of leadership: accountability to one’s self, accountability to others, and accountability to the organization. includes being humble enough to speak up and ask for advice when we need it – and to include others in the solution. Second, we should always look after people who work for us, making sure they have everything they need to do their jobs well: the right equipment, adequate resources, clear policy and guidance, and strong TTP (Training, Techniques, and Procedures). uniform and represent the Coast Guard to the world – and to do so with very highest standards of drive, determination, success, and trustworthiness. My mentors contributed to my achievements with encouragement and timely advice, such as pointing me to specific things that could help expand my professional knowledge. They gave me tips on applicable courses, books and articles to read; some pushed me to seek collateral duties that would broaden my experience. I attempt to do the same for the men and women that I mentor. Instead of focusing just on what they know, I try to open their perspectives and nudge them to things they may not have considered. Helping them understand and effectively use policies, identifying ways to take advantage of applicable tools the Service offers, or simply listening and providing a venue for venting are ways that I add value in the mentor-mentee relationship. Mentoring allows for some pretty frank conversation, which is healthy and should lead to better understanding about issues of concern. And it works two ways, because as a mentor, generally to a more junior person, I benefit from hearing how Coast Guard policies and initiatives are received…was it as the organization intended, or were there unexpected consequences that necessitate further action by decision-makers? …mentoring is a great way to further reinforce and embed values and principles among our fellow Guardians. 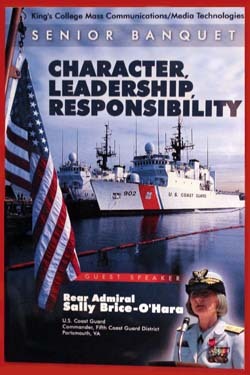 For the young men and women who join the United States Coast Guard, Rear Admiral Sally Brice-O’Hara is an example they all should imitate. As long as there are people like Sally Brice-O’Hara in the service of America our homeland will be secure. It was 2002, and a wonderful friendship was about to begin. During the past ten years, it has grown in many human and qualitative ways since we produced Making Waves:Rear Admiral Sally Brice-O’Hara. Kitch and I admire her attention to detail, her high expectations and standards, her respect for the dignity of the individual, her sense of reciprocity, her loyalty to friends and family. Sally Brice-O’Hara is a gratitude person with a heart of gold. She cares about people, and that may be her greatest strength. In more ways than words can describe, she is an inspirational and memorable Face of America on its best day. Every day of her service to America was a good day for America. She brought people together. She helped people develop their talents. She affirmed the people on her team and she looked after people in a way that enabled them to find the best edition of themselves. 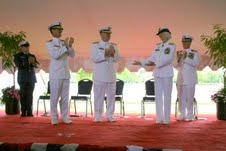 Admiral Sally Brice-O’Hara lived what she taught. She enabled the success of others because it is fundamental to good leadership. Those of us who are fortunate to know her, work with her, and serve America with her are better people because of her friendship and leadership. She can “Go out with joy and be led forth with peace.” She never let the uniform take away her heart. Thank you Sally for showing us the way to become better people, and better Americans.